In a film, stage, and TV career that spans more than fifty years, sixty-nine-year-old Christopher Walken — the star of our January movie, A Late Quartet — has surely now played every movie character imaginable. A young, small-town steelworker wrecked by the Vietnam War? Check. A schoolteacher turned psychic detective in a Stephen King cult-classic? Check. A Sicilian mobster with a hateful grudge against Dennis Hopper? Check. An eccentric but cruel crime lord who doubles as a ping-pong master? A sales clerk at Bed Bath & Beyond who turns out to be the Angel of Death? Check and double check. On TV, Walken has hosted Saturday Night Live seven times, lampooning himself and many others. An early fan favorite is his recurring role as The Continental, a self-proclaimed ladies man who tries to seduce neighborhood women into his luxurious apartment with thinly veiled seductive schemes. A later favorite is Walken’s one-time depiction of heavy metal icon Bruce Dickinson, the record producer and ex-lead singer of Iron Maiden. The classic More Cowbell skit parodies the recording-studio infighting of modern rock band Blue Öyster Cult. 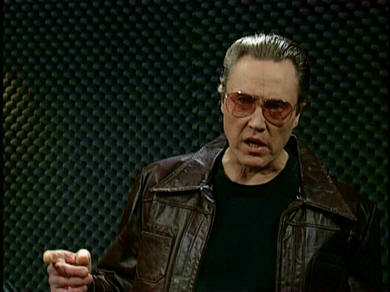 Walken struts in and out of the studio in his leather jacket and rose-colored glasses, delivering memorable one-liners — “I’ve got a FEVER and the only prescription is MORE COWBELL” — that continue to spawn T-shirts, memes, and even entire websites. Make sure to take three minutes and fifty-three seconds of your day to watch that video. It’s for British electronic musician Fatboy Slim’s song “Weapon of Choice,” and it features Walken dancing, whirling, and sometimes flying around the empty lobby of a glitzy hotel, in an intentionally schlocky routine that he helped choreograph. The video — directed in 2001 by Being John Malkovich and Adaptation mastermind Spike Jonze — won a Grammy Award for best short-form music video, took home six MTV Video Music Awards, and was named in a 2002 VH-1 list as the Best Music Video of All Time. Not bad for an actor who is often typecast as somewhere between a murderously unstable or tongue-in-cheek villain. The New York Times interviewed Walken this past November under the headline: “Christopher Walken Isn’t as Weird as You Think.” The venerable actor says his latest part as Peter, the cellist who is dying of Parkinson’s Disease in A Late Quartet, gives him a chance to play things straight, a chance to play himself. I’m definitely looking forward to seeing Walken in that role. But I’ll also be looking back with more than a little nostalgia for many of his weirder performances.